Storefront Science will be holding weekly workshops at schools in Washington Heights and Inwood beginning in January. WASHINGTON HEIGHTS — The storefront might be gone, but the science lives on. 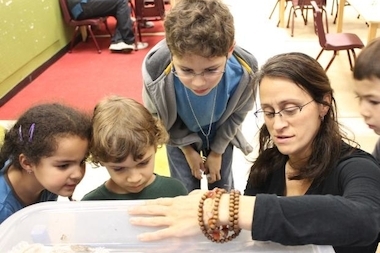 Storefront Science, the beloved uptown educational shop that was forced to close its doors in October, announced plans Tuesday to run weekly afterschool programs at several schools and community centers in Washington Heights and Inwood. StoSci on the Go, as shop owner Leonisa Ardizzone calls it, will set up shop weekly at the Y of Washington Heights, PS 278 Paula Hedbavny, Muscota New School and Mother Cabrini High School. The sessions will begin in January and will run between 7 and 12 weeks at each location. The shop's transformation was first reported by BWWorldGeeks.com. Ardizzone's old 181st Street shop, which opened in 2011, allowed children to explore scientific topics through hands-on experiments. The shop became an instant hit with parents in the neighborhood, but Ardizzone wasn't able to draw enough students to justify the high commercial rents in area. "I had a couple of students come up to me and say: 'We were told you closed,'" Ardizzone said. "They thought we were dead in the water. I like making it clear that we're alive and well." Since closing, Ardizzone has kept busy, honoring her existing commitment to kids by holding classes at the Cornerstone Church and putting together science kits that allow kids to build solar-powered robots that draw using crayons. She's also been meeting with schools in District 6 to talk about revamping their science curriculums. While the sessions at 278 and Muscota will be limited to the school's students, the Washington Heights Y and Mother Cabrini classes will be open to the general public. In addition, Ardizzone said she is working to secure additional agreements with schools in Harlem and the Upper West Side. The new model makes sense, Ardizzone said, as it allows her to bring her brand of scientific exploration to a wider range of children. "This will give a further reach for my philosophy of science education," Ardizzone said. "A lot of folks didn't want to come to 181st Street, but now I can go them." "In the end it's going to be a much better thing."